story by Liz Pacheco and Kristen Mosbrucker | photos by Albert YeeTequila, Coco and Jellybean may not seem like children’s names, but to Mark Lopez, they might as well be. “These cows are like family to me,” he says, standing in the pasture of his 100-acre Wholesome Dairy Farms in Douglasville, Pa. One of 163 raw milk dairies in Pennsylvania, the farm has seen many changes since Lopez’s grandfather began raising cows there in the 1930s. “Back in the ’40s and ’30s and such, rotational grazing was most of the way it was done.” In rotational grazing, the cows are regularly moved from pasture-to-pasture, giving the grass time to re-grow. Lopez has returned to that same system, dividing his land into a circuit of paddocks, or enclosed sections of pasture, that takes the cows two weeks to complete. With grants from the Natural Resources Conservation Services, he has also added a solar-powered watering system and a walkway and stream crossing for the cows to reduce erosion and habitat loss. But the 100-acres weren’t always dedicated to grass-fed, sustainable dairy production. Before Lopez, a bovine veterinarian by trade, took over the family farm and opened Wholesome Dairy in 2008, his uncle was running a “heavy metal” dairy operation. “That’s where you have sick cows, and dead cows,” Lopez says. “Cows in a commercial dairy must be milked as hard as possible because the profit margin is so low.” Farmers will sell their milk to one manufacturer, where it’s mixed together before being separated into various components and processed into dairy products like milk, cheese and yogurt. In these operations, cows are also commonly fed grain, not grass, so they produce more milk. A grass-fed cow — like those at Wholesome Dairy — will produce half as much milk compared with a corn- or soy-fed cow, says Lopez, but the product will taste much better. Having grown up drinking raw, unpasteurized milk from his grandfather’s grass-fed cows, the return to this practice seemed natural for Lopez, who says he made the change because he wanted the best for his animals. While developing a raw milk dairy hasn’t been easy (five years later the business is finally stabilizing), Lopez recognizes the value in his product — one produced on a small scale that has traceability and the unique identity of coming from his farm. Today, as federal agencies continue to discourage raw milk consumption, even in states like Pennsylvania where the practice is legal, that identity is increasingly relevant. Whether consumers are looking for raw or pasteurized products, local food advocates argue that it is understanding where one’s milk comes from that is most important to ensuring the product’s safety. Most milk available for sale in Pennsylvania is pasteurized — heated to 161° F for at least 15 seconds to destroy potentially disease-causing bacteria. Many raw milk-drinkers say the unpasteurized product is fresher and full of enzymes and nutrients that are destroyed when heated. The Center for Disease Control counters that the nutritional impact of pasteurization is limited to slight decreases in levels of thiamine, vitamin B12 and vitamin C. But as the pasteurization process continues to evolve, higher temperatures are being used to increase shelf life and the greater impact on nutrient content is unknown. The ongoing relationship between farm and consumer is critical in building and maintaining that trust. For Lopez, this means keeping an open door policy and inviting anyone to visit his farm and see the dairy operations. Despite this openness, Lopez is surprised at the questions customers ask. “I get ‘Are you organic?’ ‘Do you feed [genetically modified organisms]?’ ‘Do you use pesticides?’ ‘Are there antibiotics in the milk?’ ‘What do you do when the cows get old, do you kill them?’ It’s always sort of like hot-button issues.” Instead, Lopez advises customers to ask questions about the milk’s cleanliness. “Never once have I gotten, ‘What are your bacteria counts?’ ‘What’s your somatic cell count [how much inflammation a cow’s udder has]?’ And I think I would ask that. ‘Have you ever had any kind of issues with contamination?’” To date, Lopez has had no contamination problems. In addition to raw milk, Pennsylvania has also legalized the sale of raw milk cheese aged at least 60 days. Kristian Holbrok, a former chef who now manages Doe Run Dairy in Chester County, explains that the difference between the cheeses is in the bacteria. The raw milk already has the bacteria necessary to make cheese whereas the pasteurized milk needs bacteria added. But the 60-day aging requirement means any raw milk soft cheeses are illegal. Further regulation of products like raw milk cheese, may be on the horizon, a development that Holbrok says will be difficult for small farmers to accommodate. “We just don’t have the money left over like that,” he says, explaining his concern about the FDA’s new Food Safety Modernization Act. Passed by President Obama in January 2011, the act is expected to affect all farms selling food directly to the public, not just raw milk farms, and could include additional fees and regulations for food production. Currently under public review, the act’s final implications are still to be determined. Holbrok isn’t the only cheese farmer feeling pressure from the FDA. Emily Bryant Montgomery, cheesemaker at Calkins Creamery in Honesdale, Pa., originally made her Brie-style Noble Road cheese with raw milk. Despite the cheese’s popularity, Montgomery couldn’t shake the fear of FDA regulations. Recently, she started using pasteurized milk instead. Lopez is very open about the risk of producing and selling raw milk. “To address the raw milk cleanliness issue — that’s real … People can get sick if the milk gets contaminated. People can get sick if the spinach gets contaminated, or the peanuts, or the hamburger, or any food. It’s a real issue. Food safety is an issue whenever people eat anything. It’s not just a milk issue.” Despite this, raw milk dairy farmers tend to face a higher level of scrutiny at the federal level than other food producers. 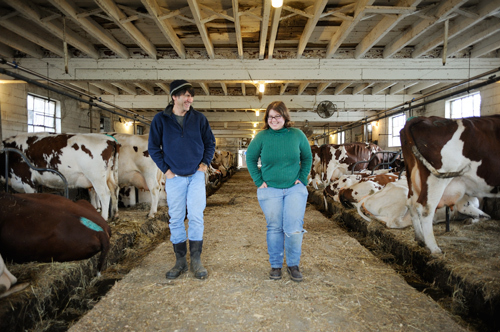 When Lopez started Wholesome Dairy in April 2008, he knew his cows were healthy, producing a clean, delicious product. The challenge was not to convince consumers of his milk’s safety, but simply to tell them his products were available. After two years — and almost shutting down the farm — Lopez was finally able to tap into the raw milk demand. “I almost feel like a celebrity sometimes. It’s really gratifying to show up with my trailer and some milk and the response is like, ‘Yeah, Mark’s here!’” Today, Wholesome Dairy products can be found at 15 stores and markets throughout the region.